« Asses of the world unite! Manifest is offering a fascinating exhibit right now: two artist’s books that use printmaking to merge images and poetry inspired by Dante’s Inferno and Purgatorio. The work draws on visions from the Italian poet’s trilogy and then reworks them as a way of meditating on what Sean Caulfield sees as the contemporary crisis of our relationship to the natural world, including the human body itself. Caulfield, a Canadian artist, got the project rolling by devising images inspired by scenes in Dante’s great poem. Caulfield is a Centennial Professor in the Department of Art and Design at the University of Alberta, and has exhibited his prints, drawings and artist’s books extensively throughout Canada, the United States, Europe, and Japan. He took his images first to Jonathan Hart who wrote poetry based on Caulfield’s work, at which point the collaborators called on Sue Colbert who helped create a unified, integrated book out of the work they’d produced. Caulfield was originally inspired by William Blake’s illustrations for Dante and Milton, as well as that brilliant, eccentric poet/printmaker’s ability to weave his world out of both text and visual imagery. What inspired me to send questions to Caulfield about his work was his reverence for poetic and artistic tradition—his eagerness to see contemporary relevance in work done centuries ago. It’s a theme that keeps emerging in this blog, the challenge of absorbing what has been done before—it’s truth, beauty and power—while finding a way to internalize and transform what’s been assimilated as the source for new work and new ways of seeing the world. Not work that looks back with a distorting postmodern irony at the limitations of the past (which might, for example, find fault with Dante’s adherence to Catholic doctrine, say) but rather to see the enduring truth embedded in earlier work despite the ways it might seem at least partly insufficient to the way the world has changed. When Caulfield encountered Blake’s work at the Tate years ago, it had such a profound effect on him that he’s still moved when he thinks about what he saw and felt that day. Blake is really the perfect model for any artist who is consumed with admiration for what has gone before and yet doesn’t want to simply imitate the work of a previous era or artist. Blake internalized Renaissance painting, Gnosticism, Swedenborg, Milton, and Dante, and he somehow emerged as the author of an entirely original and personal vocabulary and style—an entire mythic world through which he expressed fundamental psychological, sexual, political and social truths—all of which derived elements from his sources but was unmistakably the work of his own hand and voice. Caulfield and his collaborators are playing with similarly high stakes. Here’s some of my conversation with him about the two artist’s books he’s showing at Manifest, in Cincinnati, through Sept. 14. In your statement for the show, you said: “(There are) passages in the Divine Comedy, such as Dante’s description of the wood of suicides in Canto XIII, or the rain of fire falling upon the shades in Canto XIV, that are sensual in nature and which describe the human body or an environment in transformation. These compelling images, often inspired by earlier classical and medieval myths, have a power that endures in contemporary society in the face of drastic cultural, social and environmental change.” I can see how this kind of imagery relates to your situation in Alberta. Yet Dante’s work is profoundly spiritual in an orthodox way, at least looking back on it from our vantage point in history. Orthodox, though he felt himself something of an outcast at the time, living in exile. Does your work have a spiritual dimension or are you taking his imagery and ideas and applying them to a contemporary world where older structures of belief seem insufficient in dealing with the way the human species now has both the power and desire to transform the physical world? That’s a fascinating way to describe what I consider the core of a genuinely spiritual attitude, but without the religious armature: a humility toward the totality of life, call it what you will. The idea that life in all its forms makes claims on us, not the other way around. It’s something we seem to have lacked in the West, where we look upon nature as raw material or as something unfinished, needing improvement. That’s a great attitude when you’re curing a disease, but how far do you take it when it comes to shaping the world to our desires as we have the power to do with genetic engineering? In your exhibit statement you say, “By drawing on the Divine Comedy for inspiration, (we) built imagined landscapes populated by enigmatic objects that refer to both mechanistic and naturalistic forms in order to explore themes of mutation, metamorphosis and biology/technology dichotomies. Although the work looks to the past for inspiration, its merging of mechanistic and organic languages is intended to point viewers towards a contemporary context in which advancements in technology are rapidly changing our relationship to the natural world, biology, and our own bodies.” It sounds as if you’re concerned with humanity’s desire to shape its environment: our power over the physical world, including the human body. My interest in science/art stems from that fact that I have done so much printmaking, and therefore have also been drawn to the history of scientific illustration. But this direction in my work really took off because my brother is a Canada Research Chair in bioethics. (He also has a book out now called “The Cure for Everything.”) He approached me with the idea of doing a collaborative project, which led to two projects, Imagining Science and Perceptions of Promise, which brought together a group of internationally recognized artists and social commentators including philosophers, sociologists, legal scholars, and scientists. The purpose was to produce a body of original art work and a collection of essays for a series of exhibitions and accompanying publications that explored the complex legal, ethical, and social issues associated with advancements made in such life science technologies as stem cell research, cloning, and genetic testing. It was a terrific process and really opened me up to new ways of looking at the world. I’ve been as drawn to Blake’s work as much as you, going back many years to college, where I had an entire seminar on his illuminated books. We studied, in part, the way his poetry and his imagery were interdependent, yet not in the usual way that illustration provides a visual corollary to text. His work unified words and images to the point where they were integral, interdependent parts of one form of expression. The first time I saw Blake’s work in person was at the Tate gallery when I was an undergrad…and it was one of those interesting experiences that has just never left me. Who knows, maybe it was just my mood that day, but there was such an incredible force and intensity about the work that I just could not shake the images from my mind…the feeling stays with me today. Beyond that gut reaction, I am also drawn to the complexity of his language. He draws on these other sources but shapes them into a personal vision that reflects doubts, uncertainties and longing . . .
Can you describe the actual physical books you’ve created? There are two artists books (in the show), Darkfire and The Waiting Room. Both are unbound in portfolio boxes with cloth, silk and hard covers. 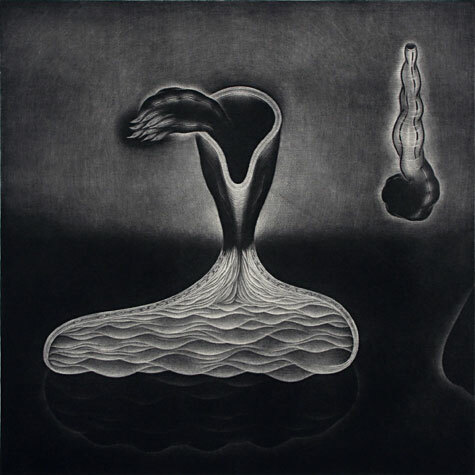 The prints are all mezzotint, intaglio and chine colle. The images are printed on Japanese gampi and then chine colle to hahnemuhle (german etching). The text pages are all printed on the letterpress off of polymer plates (the typeface is called Dante!). For the exhibition we have framed all the prints and then displayed the text pages in the open portfolios. Both portfolios have a title page and colophon. How does your collaboration with your partners work? I was fortunate to find a colleague, Jonathan Hart, who shared some of these interests, to create poems that hopefully echo and compliment the imagery. Finally, I also worked with a typographer/designer, Susan Colberg, who brought a lot to the project…Both were helpful in stirring new ideas and encouraging me to continue. We are in the midst of trying to work through Paradise…I find it a much more difficult work…but hopefully I can bring something together. The usual process for the collaboration is for me to start with a group of images and then bring these to Jonathan Hart. We discuss what I have been thinking about, and how I have tried to draw on a particular part of The Divine Comedy for inspiration. He then will respond to all this and produce poems. He gives these back to me and the ball gets rolling. Once we are about halfway into a book we bring Sue Colberg into the mix and she suggests ideas about the overall project – number of images, layout, arc of the text, etc. Throughout the process, however, both Sue and Jonathan are a huge source of support and inspiration…suggesting different ways to interpret Dante’s text.